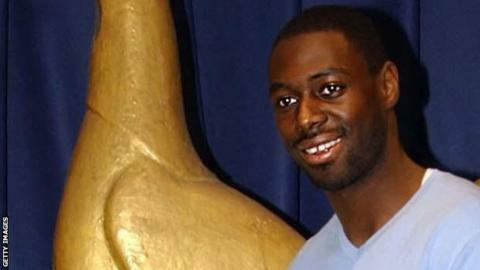 Former Tottenham Hotspur defender Ledley King says his dream would be to manage the Premier League club one day. The ex-England international, who made 323 appearances for Spurs before retiring in 2012 after a spate of knee injuries, is now a club ambassador. King, 33, has also started to take his coaching badges. "I will complete my badges and it would be a dream come true for me to lead the team out as a manager," said King who was a one-club player. "It is early days for me still. I've got a lot to learn on that side and I realise how difficult it is. "I will take my time, try to get my badges and all you can do is see where you go from there." Former Tottenham players Les Ferdinand, Steffen Freund and Tony Parks are on the coaching staff alongside ex-Spurs midfielder Tim Sherwood, 45, who has been in charge at White Hart Lane since December after the sacking of Andre Villas-Boas. Sherwood's future is uncertain, however, with current Netherlands coach and former Ajax boss Louis van Gaal recently linked to the manager's job. Spurs are currently sixth in the Premiership, eight points behind rivals Arsenal with six games remaining, and have a very slim chance of finishing fourth to set up a shot at Champions League football next season. King said the transition from the pitch to the dugout was not as straightforward as many people might think. "It has been difficult [for Tim]," said King who captained Spurs to Carling Cup glory in 2008. "I believe he is going to be a top, young manager... he is doing his best to get the best out of everyone. "I have started to do my coaching badges and I realise that it is tough on the other side, being a manager. "It is similar to being a fan in some respects - you want to get on the pitch and try and help but you can't."